Set Different Date Ranges For Each Widget! You can now set different date ranges for each individual widget! A lot of customers have asked for this lately, so our development team have worked hard to make it happen. 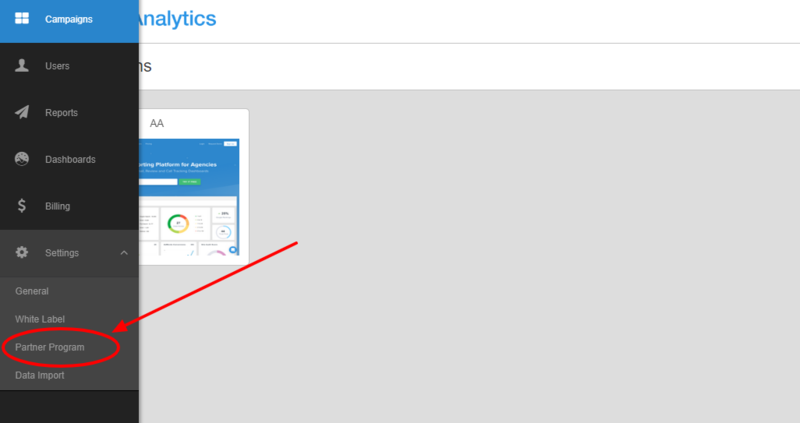 To set different widget date ranges in custom dashboards and reports, simply go to the widget's settings. It's that simple! This new feature is available right now in your account, so you can start using it right away. Show your current data vs. all-time data, to quickly give clients a more complete picture of their online presence. Instantly see today's data compared to yesterday, or the current month versus previous month, to show your ongoing improvements. Compare this quarter to last quarter, for a bigger picture overview. 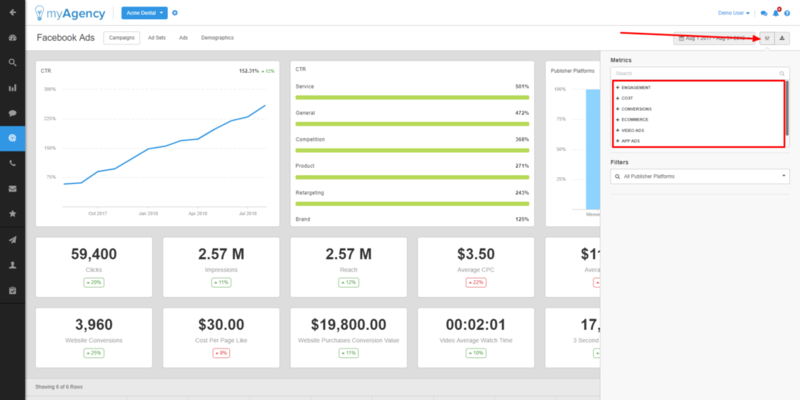 Mix and match all of the above, to build hyper-custom reports and dashboards! Of course, the default setting for all widgets will always be the date range you set with our date range selector. Now though, you're free to get even more specific with the data you present to clients! Read more in today's blog! We've just rolled out an update to make things clearer when using our "All Time" date range option. You'll now see the exact date in our date range selector, rather than the words "All Time". Of course, you can always choose any custom date range to see data from as far back as you need... This includes seeing data prior to when you subscribed to our platform (as long as it's available, of course!). We've just updated our user management interface to make things even easier! Creating staff and client user accounts is now easier than. Based on your feedback, we've also added the ability to clone user permissions! The first thing you'll notice when adding a user is our new wizard-style interface. We've implemented this change to help guide you through each step, so you can be sure you don't miss anything important. To streamline the process, you'll now use the same button to create both staff and client users, and you'll be prompted to choose the type of user at the beginning of the wizard. The next screen will look quite familiar: This is where you'll enter your user's details, and email the login credentials to the user if needed. 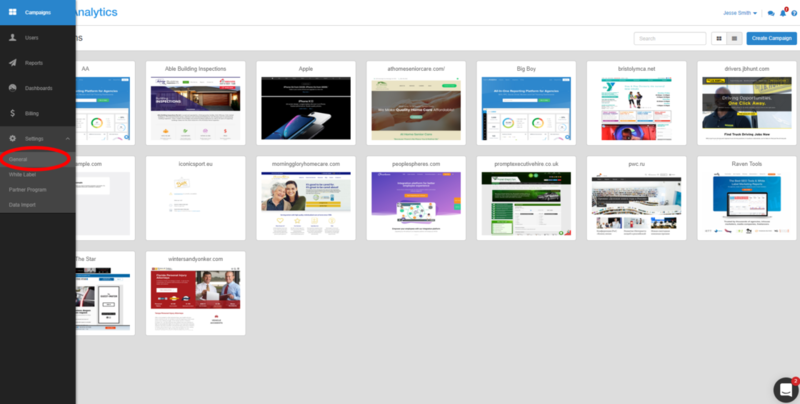 Next, you can specify exactly which campaigns the user can access. 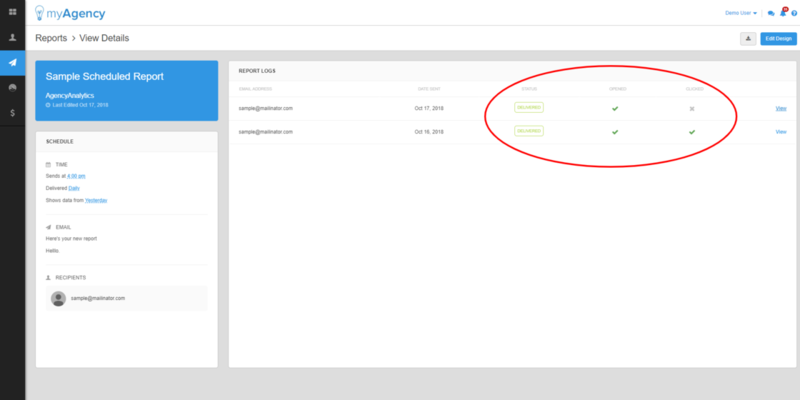 Staff users have an option to automatically access all campaigns, otherwise you'll be able to specify the exact campaign(s) each user can and cannot see. There's also a search box, to make finding campaigns quick and easy. On the next screen, the new user permission options are definitely going to be exciting for some of you reading this! You can choose a quick default setting: these are slightly different depending on whether you're creating a staff or a client user. As usual, you can also dive deep into each feature and integration to specify exactly what the user can access. Based on popular demand, we've also added the option to clone user permissions. This will make setting up multiple users a breeze, since you'll be able to quickly copy their exact permission settings! Once you've created those users, we've also added some new options to make editing their permissions much easier. You'll now see three options in the drop-down menu when clicking the edit user button, so you can quickly make the exact changes you need. Thanks to all of our customers who provided feedback on our user management features. We're always excited to make updates based on your suggestions, so keep them coming! Remember that there are no limits to how many user accounts you can create, so feel free to add every client or staff member who needs access. Big news! We've just added zip code based rank tracking, the ability to tag keywords when adding them, new keyword research options, and more. we think you'll be thrilled with today's update, which brings some of your top rank tracking feature suggestions to the AgencyAnalytics platform. A Brand New "Add Keywords Wizard" Interface"
We've modernized the look and feel of the "Add Keywords" feature by switching from a pop-up window to a full screen "wizard". This change should ensure that adding keywords remains an intuitive and easy to understand process for brand new users while giving us the scalability to add additional features for more advanced users. The new interface is a multi-step wizard that guides you through each option, making it less likely that you'll miss anything and run into issues! Steps 1-3 should be familiar to anyone who's used our old "Add Keywords" feature. Step 4 - and some of the exact functions in the other steps - are brand new, and I'll talk about them separately, below. You read that right! 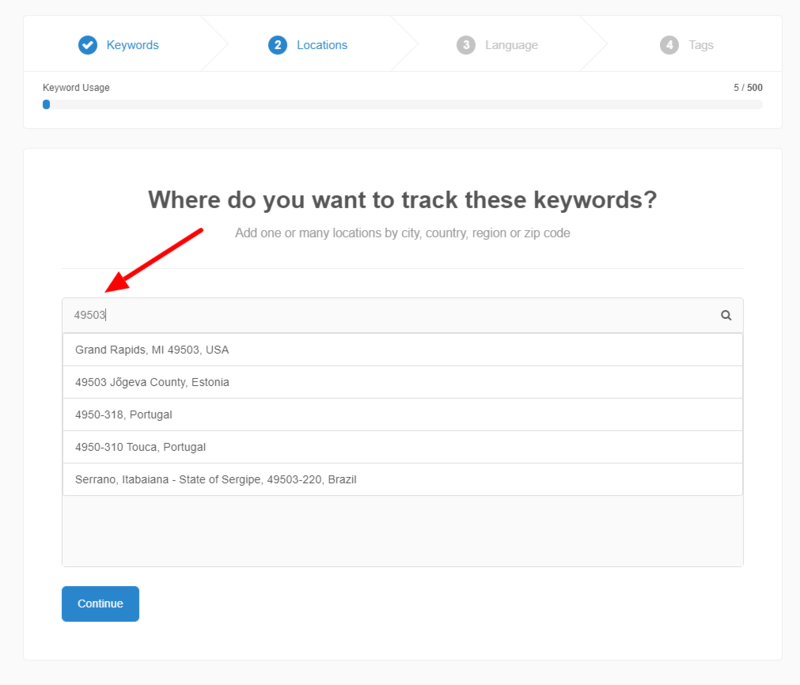 In response to overwhelming demand, you can now track keyword locations down to the ZIP code/postal code level. You're no longer restricted to tracking from the city center of large metropolitan areas! This new feature is a sea change when it comes to fetching granular, hyper-localized rankings for local businesses, and we're stoked to be able to provide it to our customers. No special instructions required here. Just enter the ZIP code/Postal code as the location being tracked in step 2 of the new "Add Keywords" wizard. 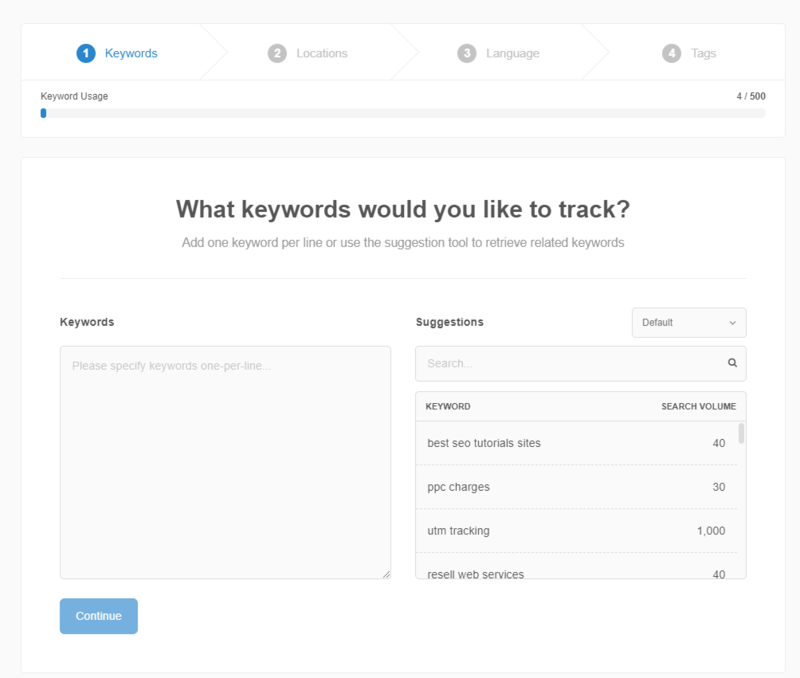 We've added a MUCH more robust keyword suggestions tool. You'll find it in the first screen of the new "Add Keywords" wizard. 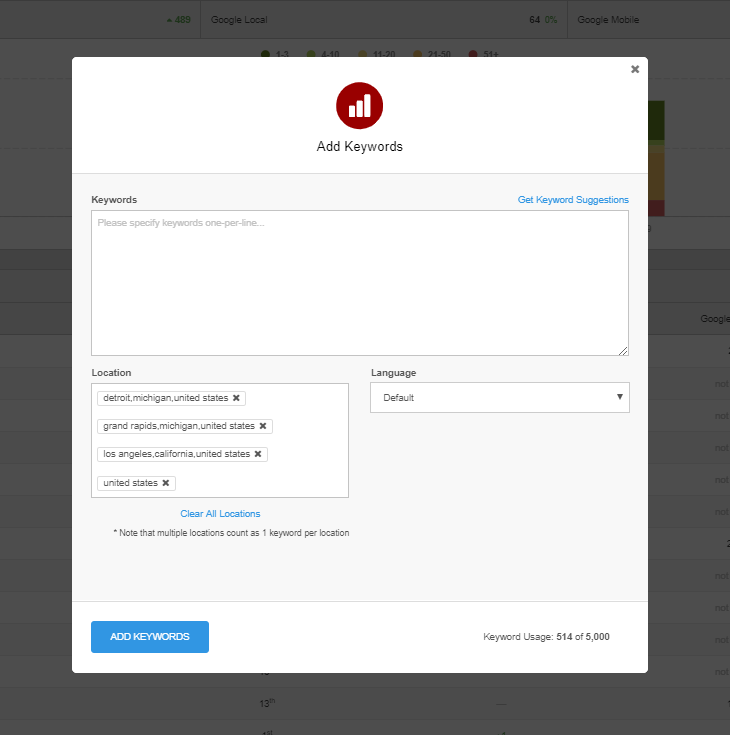 In additional to our standard (default) keyword suggestions tool, you can now pull keyword suggestions from SEM Rush, Google Search Console, Google Ads, and Google Analytics Paid Search. 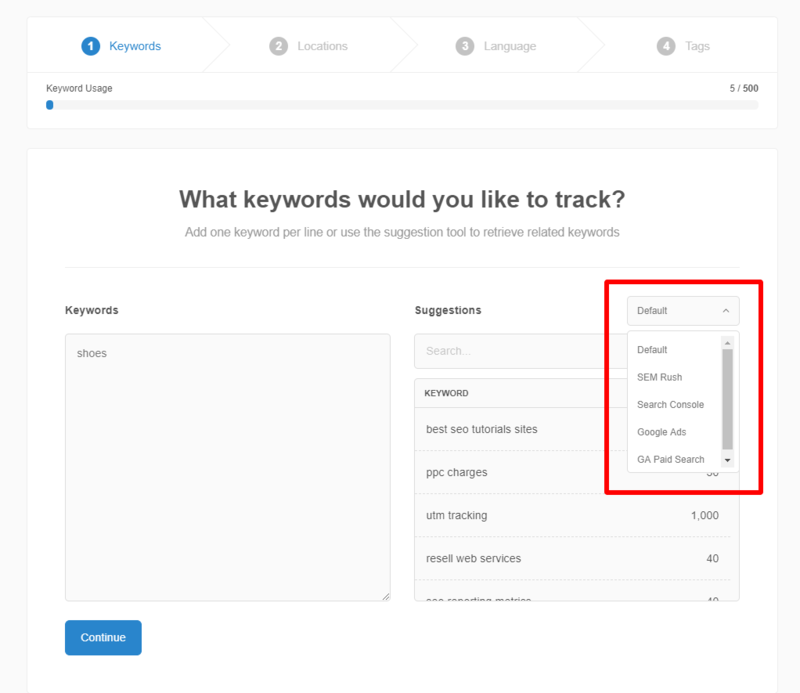 Note that for all of these except for the Default suggestions and SEM Rush, you'll need to connect the associated integration so that we can pull these suggestions from your (or your customers') account. We would have never realized what an important feature this was to our customer base without your feedback. To everyone who requested or voted for this feature - thank you! 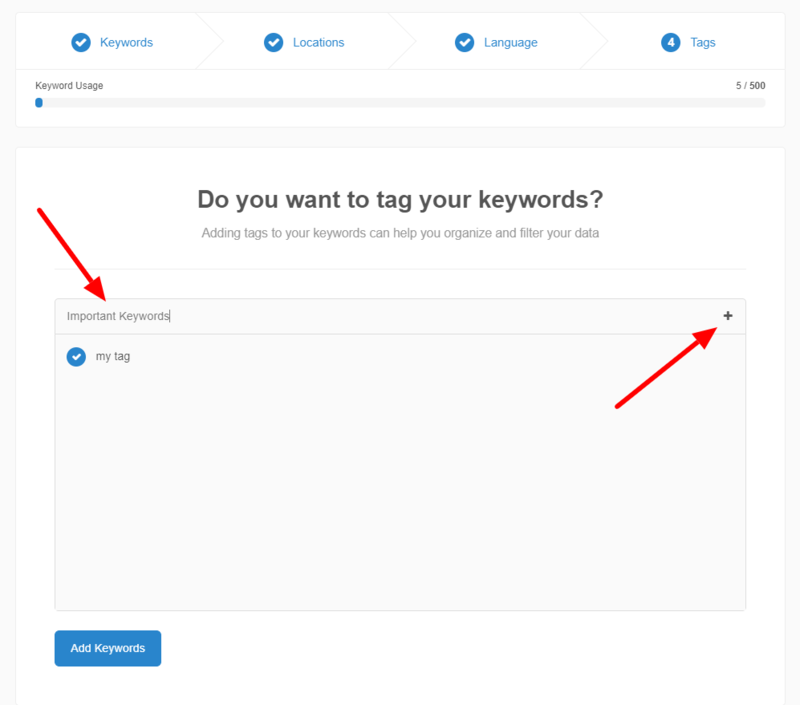 You can now tag keywords at the time that you add them, which saves you from having to try and sort through those keywords to tag them afterward, when they might be buried in a "sea" of other un-tagged keywords. This should take care of a major pain point for our larger agency customers. In Step 4 of the new "Add Keywords" wizard, just type the tag that you'd like to apply and - if it's a brand new tag - click the Plus (+) button. So that's everything! We hope that you have as much fun exploring these new features as we had creating them. Three of our integration partners are making changes which resulted in changes to the AgencyAnalytics platform. First, Google has shut down the Google Plus platform. It no longer exists. As a result, we've removed the Google+ integration from our system. Second, Google Search Console has removed crawl errors data from their platform. In turn, we've removed the crawl errors section from that integration. The good news is that we've be adding "countries" and "devices" data to our GSC integration to take the place of crawl errors. So in turn, we've updated our system to work with the V2 API. This change is fairly transparent to customers, other than the fact that everyone using LinkedIn in our platform will need to re-enter their credentials for one campaign to refresh the connection. 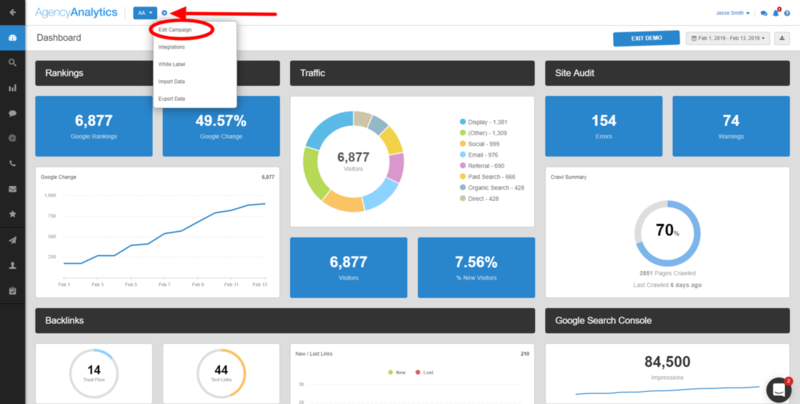 We've just added the ability to add a markup or margin percentage to PPC reports! And that's not all; along with this update, we've also updated the look and feel of our campaign settings screen and added the ability to configure rankings settings prior to adding keywords. More about those items later. Until now, our reporting pulled in the exact metrics from your PPC accounts, with no option to edit those numbers before they were presented to clients. This wasn't ideal, because agencies often charge clients a markup on PPC spend. And showing clients the pre-markup numbers just leads to un-necessary questions and misunderstandings. Over this past quarter, the PPC markup option went from being a feature that we would get an occasional request for, to being one of the most highly requested features across our customer base. As of today, the agency markup feature is available on all AgencyAnalytics accounts at the Agency ($249/month) plan and above. If you don't see it in your account yet, please refresh your browser. To apply the same account-wide markup percentage to all of your client campaigns at once, start in your root campaigns control panel, open the left hand navigation menu, and choose Settings --> General. In the General Settings screen, scroll to the bottom, enter your markup percentage and click "Save". What, you thought it was going to be more complicated? Sorry to disappoint! But what if you want to configure different margin percentages for each client? To configure a customer-specific margin percentage, navigate to the campaign where you want to apply the markup, click the "gear" icon at the top of your screen, and choose "Edit Campaign". Scroll down to the bottom of the Campaign Settings screen, enter your PPC margin for this customer, and click "Save". Note that the campaign level margin settings supercede the account level margin settings. 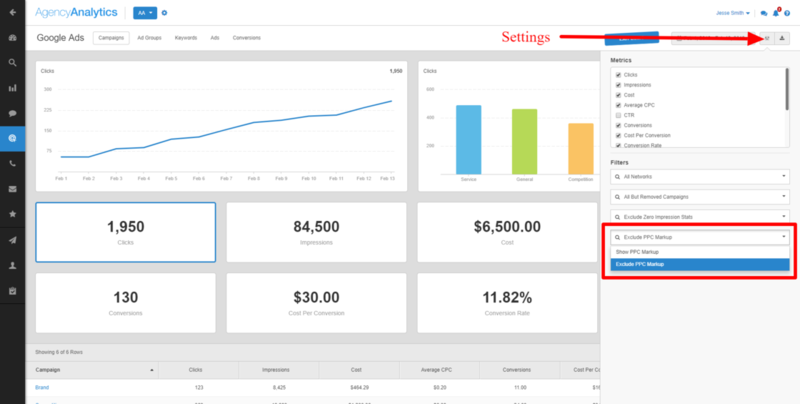 So you can set margin at the account level, which will apply by default to all campaigns. But then if you have an enterprise client, for example, with whom you've negotiated a custom markup rate, you can configure the custom rate at the campaign level for that client. The account level margin will stay in place for all other campaigns, while the custom campaign level margin is applied to the enterprise client. Margin amounts will be applied to the PPC cost metrics in reports by default. But in the individual integrations, the admin and staff users can toggle back and forth to see cost metrics either with or without margin. In addition to the PPC Margin feature, we've also made an important adjustment to our keyword ranking settings. Previously, the ranking settings were only accessible AFTER adding keywords. The issue that this presented was that your first day's worth of rankings were then fetched with the default settings, which could skew the way that looked compared to later rankings fetched with custom settings. Now, you can access critical rankings settings prior to adding keywords from the "Campaign Settings" area. So once you've created a campaign, go ahead and enter that campaign, then click the "gear" icon at the top of your screen and choose "Edit Campaign". Finally, you may have noticed a brand new look and feel for the "Campaign Settings" section that I mentioned above. What do you think of the PPC Margin option and the other new features? Let us know in the comments! You can now earn credits toward your AgencyAnalytics membership with our partner program! In your admin account, click "Settings" in the left-hand control panel navigation, then choose "Partner Program" from the drop down. In the Partner Program section, you'll find a few important data points. Coupon: This is the code that customers who you refer will need to enter when they check out in order for you to get a credit. If the customer doesn't enter this code, we can NOT credit you manually. So when you're telling a friend how much you love AgencyAnalytics and they want to try it for themselves... just be sure that they enter that coupon code that you provided to them when they check out. You'll get a credit toward your next invoice, and they'll get a 50% discount on their first monthly payment. 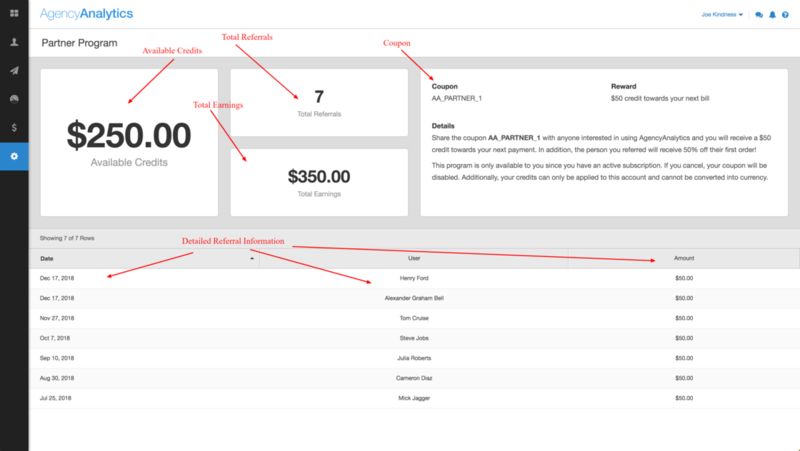 Brand new for Enterprise users: Multiple white label profiles in each account! You can now apply a separate set of logos and brand colors for each individual campaign. No limits. Have 10,000 campaigns? Then you can have 10,000 separate white label profiles. Account level white labeling settings are still available, and function the same way that they always have. The account level settings are used to configure the custom URL and custom URL landing page. Campaigns without custom white label settings will fall back to the account level white label settings. Check out this blog post for full details and a walkthrough! We've just released a host of new Facebook Ads metrics! As always, the new metrics have been made available within our reports editor as well, under the "gear" icon for any individual widget. You can now review the engagement level for each individual client, on each individual report. Status (Delivered/Bounced) Opened Clicked These metrics are shown separately for each individual email address to which the report was sent. Our hope is that these statistics assist customers with engaging their end users. Surely AgencyAnalytics will start publishing changelogs very soon.